Stories x Coding: Nursery Rhymes, Stories, Adventures and more! Scratch Jr. 3 begins where Scratch Jr. 2 left off. Kids will learn how to program new commands and create more complex programs. 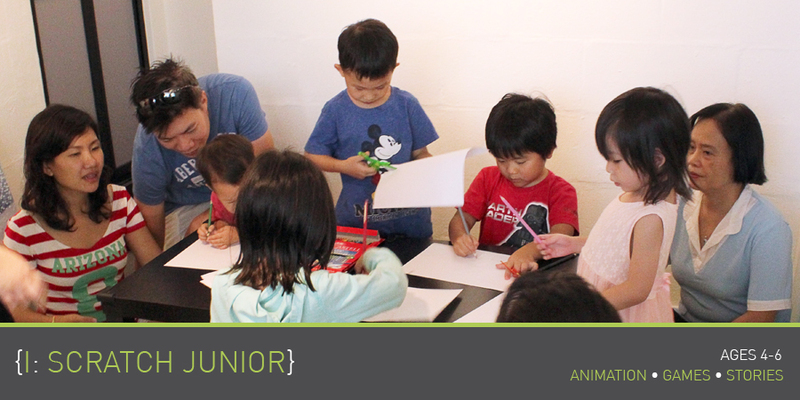 In our specially curated preschool coding program, kids will learn how to code with a new story every lesson! With familiar favorites inspired by The Very Hungry Caterpillar, Five Little Monkeys and more, kids get to dramatize and program each other to act out the iconic scenes in the book, followed by putting it together in a digital tablet animation*! Come join us on a Coding Adventure which brings your child through the jungle, mischief in the house, showing their love for Daddy, and finally a wondrous train ride filled with bumps and turns. It is bound to excite your little coder, and they will never see their favorite books in the same way again! Our proprietary, award-winning MIT-inspired curriculum builds up your child’s understanding of the coding language and inspires them to think logically. Your child will be able to understand how to use coding blocks and sequence them in the right manner to form a story or a mini game. Concepts such as loops, motion and Events will be incorporated in class, in a way that the children will pick it up in a natural and fun way, all with minimal screen time. Through a combination of Reading, Drama, Kinaesthetic learning and craftwork, your child will learn computational thinking and problem-solving in a novel and exciting manner. Scratch Jr. 2 begins where Scratch Jr. 1 left off. Kids will learn how to program new commands and create more complex programs.